A 10 minutes documentary was made to voice the opinions of the villagers living in Don Chai Saktong on the issue of building the upper and lower dams along the Yom River. The documentary would cover the media misrepresentation of the villagers’ views, the government reason for dam building, the impacts on the teak forest, fishes, nature and the villages upon building the dam and the villagers hope for the future. The motive of making the documentary stems when media misrepresentations were uncovered through interaction with the villagers. 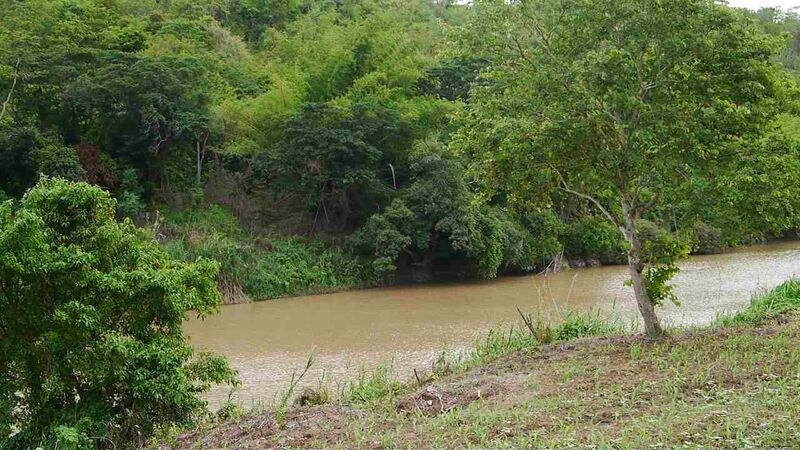 The online media, like Bangkok Post, reported that the villagers were in favour of the alternative dam project – the building of the two “smaller” dams and 17 water retention areas instead of one large Kaeng Sua Ten dam. This support was not evident in the village community because the so-called “smaller” dam proposed by the government were not much smaller than the first proposed one and the negative effects of building the two “smaller” dams were not much different from that of the large dam. The actual project that the villagers really support is the building of water retention areas which the villagers referred to as smaller dams. 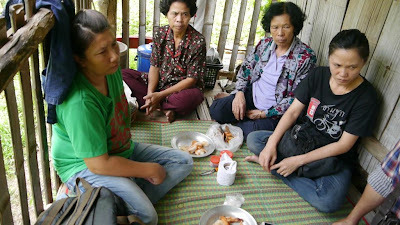 The villagers’ reasons for protests against the dam project is not only to the fact that they would need to relocate when flooding of their village occur, taking away 200 years of village culture and heritage, but also due to the impact that Thailand’s largest teak forest, home to many animal species, would also be destroyed which would lead to much environmental and ecological degradation. 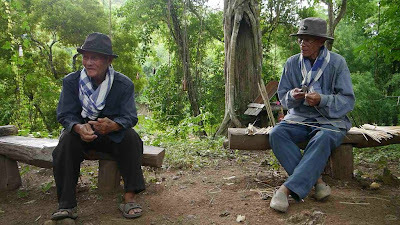 Moreover, with 23 years of resistance, the villagers had been so far the longest standing group against dam projects in Thailand. If the project were to be executed, it would mark a milestone for all other dam projects in Thailand to proceed. The peoples’ hope for the future is for the government to lay the dam projects to rest as mega dam projects would cause more harm on the people and the environment than the good in the long run. 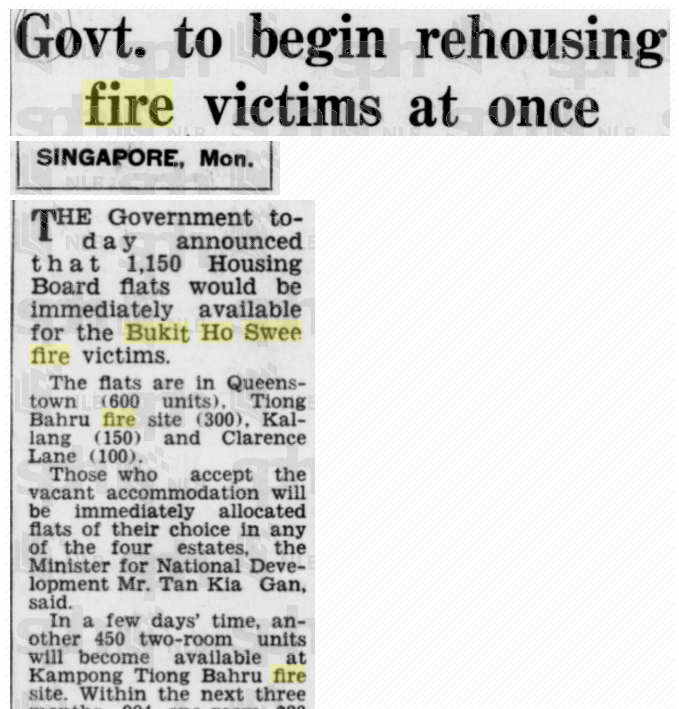 A comparative study was made in Singapore using the 1961 Bukit Ho Swee fire as a case study. During that period, Singapore was undergoing massive housing re-development, however the people were reluctant to move out of their kampong houses and community. 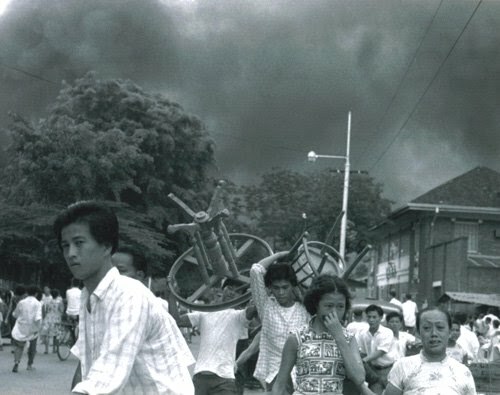 A fire than sparked on 25 May 1961, leaving 1 dead and 67 injured. Since then, the cause of the fire remained unknown and police reports were kept confidential from the public. The government and media reported it as unfortunate incident that was bound to occur due the fact that most houses were made out of wood which were highly flammable. However, there were rumours at the ground level that a triad in the area was given incentives to ignite the fire on purpose to clear the land for housing development. The Bukit Ho Swee case study is worth looking at in relation to the dam project proposed in Thailand as both projects affected or affect the livelihood of people living in a community. The Bukit Ho Swee project also face resistance by its people to relocate, indicating a lack of compromise between the government and its people. Kaeng Sua Ten and Bukit Ho Swee are 2 sites worth comparing because in both situations, developmental projects - namely the building of the Kaeng Sua Ten dam and housing projects respectively - have been resisted by the people on the ground as these projects require the people at the ground to relocate hence affecting the people's livelihood. Kaeng Sua Ten serves as a good example to evaluate current measures of resisting governmental project whereas Bukit Ho Swee serve as an example to evaluate the pros and the cons if developmental projects are pushed through despite the presence of dissenting voices. In both projects, people on the ground have or had various measures of resistance. 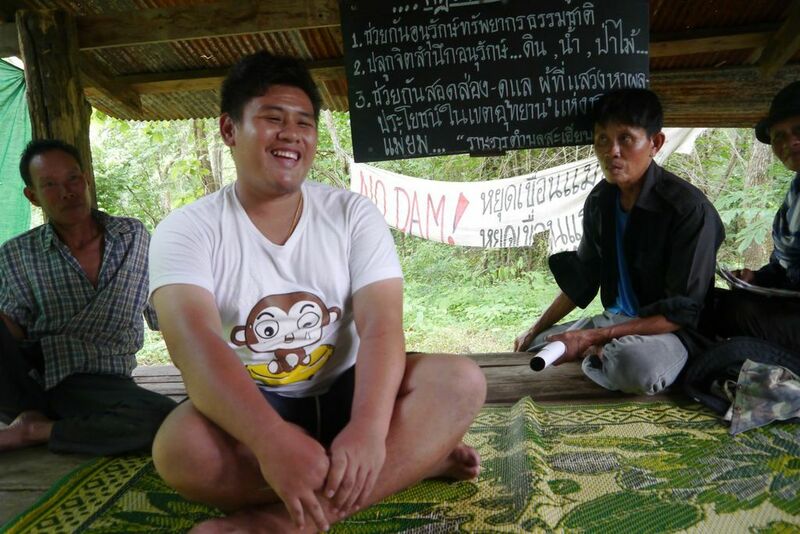 In the project to build the Kaeng Sua Ten dam, villagers resisted the project through various means. One, every household in each of the 4 villages affected by the prospective flood would routinely take over the duty of being a village guard. The village guards are stationed either at the prospective dam site or at the entrance of the road leading to the dam site. These village guards are armed with knives and they check through every visitor visiting or passing through the dam site, ensuring that any governmental body or organisation in support of the building of the dam have no access to the dam site, hence unable to carry out any form of work. Two, every village leader have to vow to be against the dam project before taking on their position. Three, to ensure the continuity of opposition towards the dam project, youth groups are also set up and educated on the impacts of dam building. 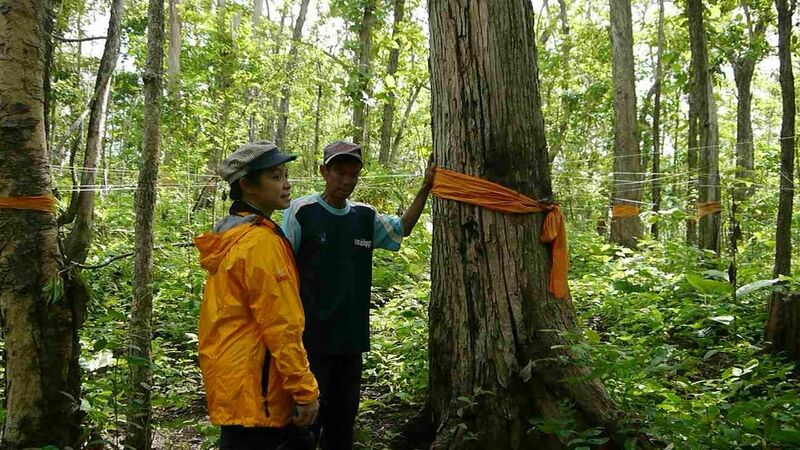 Also, because one of the negative impacts of building the dam include the flooding of Thailand’s largest teak wood forest, the Teak Forest Lover Group was set up for the conservation of the teak forest. This group ensures that the regulation to prohibit logging in the teak forest is enforced and helps to manage the teak forest area. Teak tree ‘ordination’ ceremony is held every year whereby all villagers are engaged in the ritual of tying monk robes around the teak tree to symbolize the spiritual nature in the teak tree. This ritual also serves as a form of deterrence to loggers not to log the teak trees in fear of being haunted by the tree spirit. 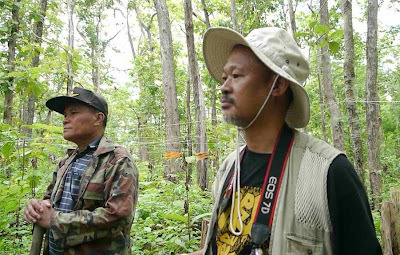 In the teak forest, Som-ming, Leader of Anti-dam group (Left) and Noi, member of Teak Forest Lover Group, gave an account of impacts on the teak forest if the dam were to be built. Similarly, in Bukit Ho Swee squatter settlement, there was also various means of protection of the community from governmental intervention. One of the most prominent form of protection was the presence of triads and secret societies within the settlement. The triads were mostly made up of youths who receive low education. To those outside of the community, these triads were notoriously dangerous. However, to the dwellers of Bukit Ho Swee, these triads were like the ‘police’ of the community. They helped in preventing crime and safeguard the harmony within the community. A local dweller, Lily Wee expressed that she felt safe with the presence of the triads. These secret societies imposed a financial levy in the community for any economic activity which was willingly accepted by the local dwellers.1 With the local secret societies in place, it acts as a form of deterrence for the Housing Development Board (HDB) to conduct any massive relocation of the community. In both the dam building and the housing development projects, the presence of resistance indicates a lack of community involvement in state decisions and governmental projects. If governmental bodies were to work closely together with the local communities and seek out the wants and needs of the community instead of taking a paternalistic stance, resistance from the ground would not be present or as strong. By working in a disconnected manner, the goals and beliefs of the government and the local community for both sites were also vastly different. In the building of dams along the Yom river, the government’s most recent motive for the project is for flood protection of the city areas downstream of the Yom River. However, the local villagers view the government to have a different motive than flood protection. Some villagers and non-governmental organisations (NGOs), like Living River Siam, have conducted research on dam building and evaluated that minimal flood protection would be provided when the dam is constructed as the rain might occur downstream the location of the dam and flooding would still occur. 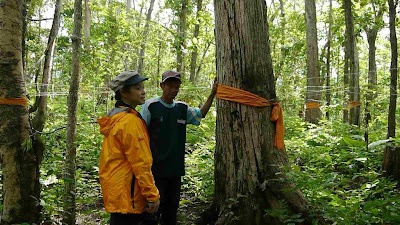 Instead, the speculated motive deemed by the villagers is that contracts between governmental bodies, logging companies and tourist companies have been signed such that when flooding of the teak forest occur upstream of the dam, logging companies would be able to benefit from the valuable teak trees cleared away and tourists companies could start up resorts and turn the area into a tourist attraction which help contribute to the economy. The villagers are against these motives. Instead, value their 200 years’ worth of village culture and heritage, and the natural forest and river surrounding them hence would not forgo these for economic gains. Similarly in 1961 Bukit Ho Swee, the government’s view of the squatter settlement is that it is unhygienic, unsightly and unliveable, therefore needed to be re-developed. The government view that the squatter dwellers’ reluctance to move was due to the uncertainty of change and if the people were given a “luxury” flat, they would in the end appreciate it. However, people living in the squatters beg to differ. They valued the dynamics of their community where their friends, family and jobs were and would rather sacrifice the “luxury” flat provided for what they consider as socially safer communal living. Another mistrust between the government body and the Bukit Ho Swee dwellers stem from the difference in belief of the cause of the fire. The government’s stance was that a great fire was an accident which was bound to happen sooner or later due to the nature of the squatter houses made out of flammable wood and the houses so closely packed together. However, rumours were present amongst the dwellers of Bukit Ho Swee that the government was behind the fire for reasons that there were already semi-built houses near the area, the fire occurred on a public holiday when most firemen were off duty and that some people claimed to have seen a man throwing a stick of fire to ignite the fire. Through this difference of views from the government and its people, one can infer that there was a lack of trust between the people on the ground and the government for the difference in beliefs to exist till today. In both cases of dam building and the Bukit Ho Swee inferno, the difference in beliefs and goals between the government and the community are not easily seen as the media often portray government efforts to be working for the people. It is only when people on the ground are being interviewed then the difference in beliefs start to surface and one starts to doubt whether the government’s ‘developmental’ plan really works in favour of the people. In an article published by The Nation on 7th October 2012, it reported that the locals are in support of the building of smaller dams in place of the Kaeng Sua Ten Dam. 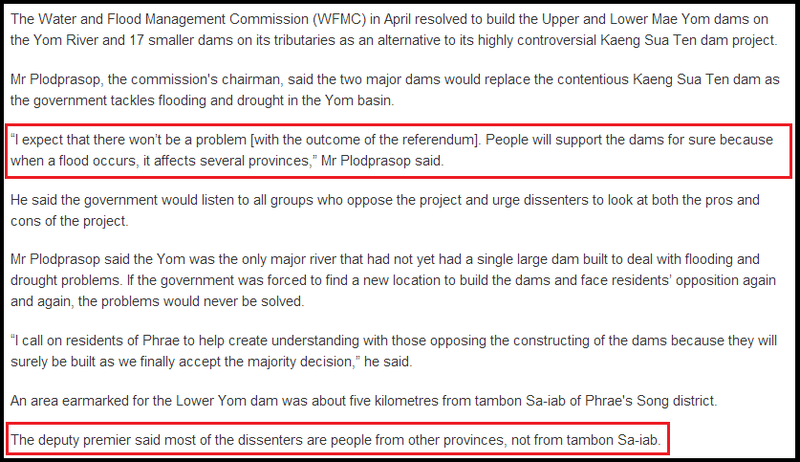 Excerpt from the article "Smaller dams are better than Kaeng Sua Ten, Says Locals" published by The Nation, 7 October 2012., retrieved 2 August 2013. This was true that the locals indeed prefer having smaller dams which they refer to as phis, which are small water retention areas. However, this support might have been misinterpreted into support of the current alternative dam project in the building of the two “smaller” dams, as reported in Bangkok Post, 21st July 2013. The villagers in Tambon Sa-iab are actually not in support of the building of 2 alternative dams because they do not believe that the dams are very much smaller and the impacts of the alternative dam project would still remain similar. Due to the two words “smaller” and “dam” being very subjective, the media represented the villagers’ support for the small dams which embankments are less than 20 feet in height and river capacity less than 100 acres-feet, as the support of the proposed “smaller” dam of greater than 50 feet and river capacity more than 10000 acre-feet. 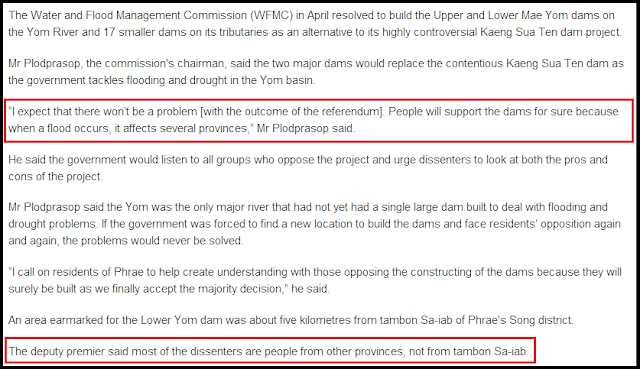 These statements boxed in red gives readers the impression that the people from tambon Sa-iab do not oppose the alternative dam project. However, upon visiting the village in tambon Sa-iab, it was clear that the entire village was in opposition of the building of the 2 alternative dams. Large banners protesting against the dam was in sight the moment one set foot into the village. Some villagers also wore anti-dam T-shirts as a sign of protest. Similarly, for the case of the 1961 Bukit Ho Swee, the way the media portray the squatter settlement was very different from that perceived by the dwellers themselves. 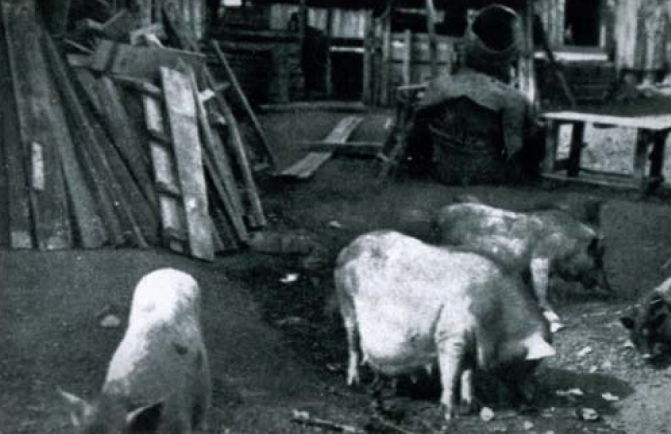 Newspapers often publish photos of animals such as pigs running around in the village were often taken amongst garbage areas, to portray unhygienic environment. The secret societies and the triads who were regarded as social security personnel by the community were represented as dangerous havoc-making gangsters by the media. After the great inferno, in order to create an image that the inferno was bound to happen and it was a “blessing in disguise”, press release and history records often highlight that the houses in the squatter areas were highly flammable, fire hazards were rampant and overcrowding was a big issue then. With the fire, the media portrayed it as a blessing in disguise to clear the “messy” squatter areas for good “luxurious” housing development. However, in light of the fire, most Bukit Ho Swee dwellers expressed their grievances of a community destroyed by the fire instead of seeing the fire as an opportunity to develop. 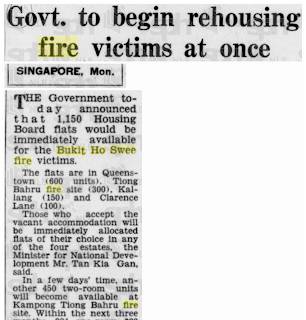 Also, to emphasize on the governments’ efficient reaction to the fire, newspaper articles often published articles which highlight the speedy re-housing of the former Bukit Ho Swee dwellers instead of the rumours amongst the dwellers of Bukit Ho Swee that the government was behind the starting of the fire. Ever since the incident of the fire, the rumours regarding the cause of the fire had not been addressed till recently in 2013. A the Straits Times newspaper published a on “Squatters to Citizens” by Dr Low Kah Seng, which a commented that these rumours were not addressed in his book. 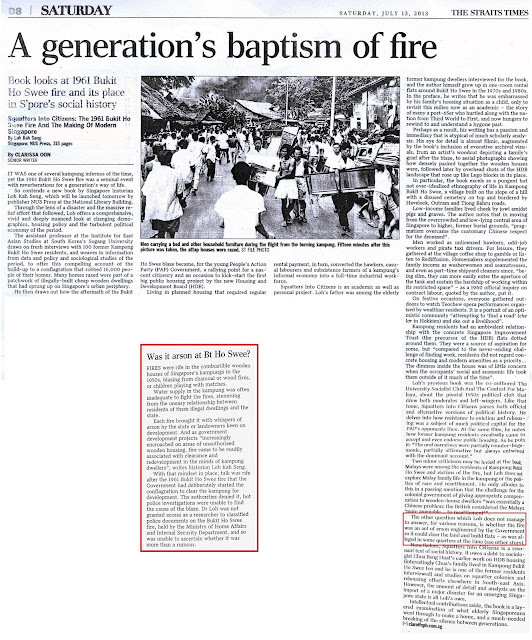 The full length book review published on 12 July 2013, in The Straits Times on the book "Squatters to Citizens"
This turn by the mainstream media to finally publish and address a concern of the local dwellers of Bukit Ho Swee might shed some light that voices on the ground are finally being heard and publicly recognized by the media. However, unfortunately the voices of the ground were only heard 52 years after the incident. This makes one wonder if it would also take 52 years for the voices of the people affected by the dam project in Phrae province to be heard and published by the mainstream media. In conclusion, through the comparison of both case studies, one can tell in both cases, disconnections exists/existed between the government and the people on the ground which livelihoods would be vastly affected by developmental projects. The disconnections are evident through analysis of resistance present within the community, the different beliefs and goals between the people on the ground and the government body and the prevalence of media misrepresentations of the people of the affected community. Through interaction with the community at hand, one can then sift out the real sentiments of the people, their wants and needs. After all, development should start and end with the people of community in mind instead of breaking up communities, culture, heritage and identity for an economically beneficial project which ultimately leave the community socially fragmented. Loh, Kah Seng. 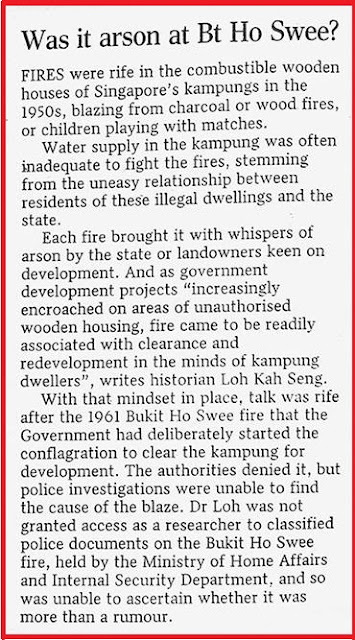 “The 1961 Kampong Bukit Ho Swee Fire and the Making of Modern Singapore” Murdoch University. 2008. 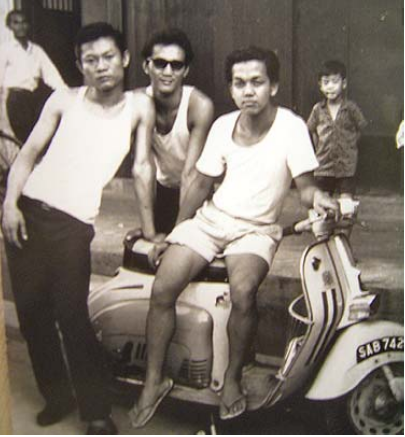 Before 1961, Bukit Ho Swee used to be a squatter settlement in the Singapore City. Unauthorised Houses were made with wood frame huts with thatched roofs. Inhabitants of Bukit Ho Swee were mainly Chinese who lived in Kampong houses. In late 1950s, the Peoples' Action Party came into power and with the British colonial regime advocated massive development plans for Singapore. Housing was of utmost importance in the governments' town planning. At that time, there was a shortage of public housing. Overcrowding and squatter colonies were prevalent. Squatter housing was deemed as cramp, unhygienic. 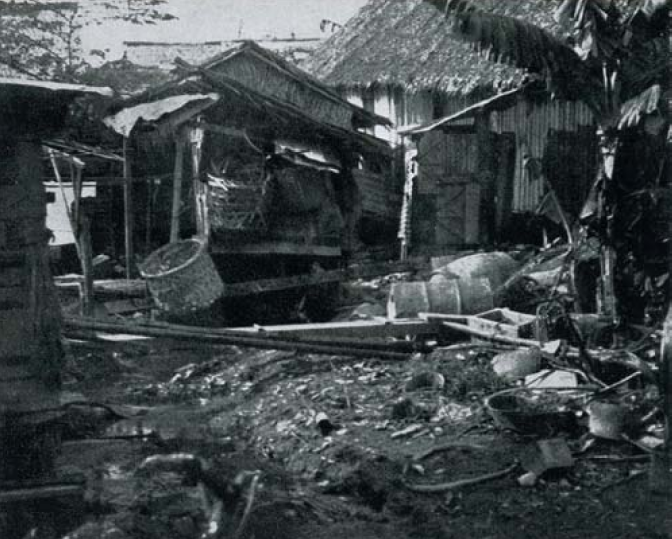 Water and electricity was also highly inaccessible by many communities. Also, squatter houses which were made of wood which were highly flammable. The government thus initiated many relocation plans to develop public flat housing for its people which they labeled as “luxurious” because they were spacious and equipped with basic electricity and water amenities. However, their re-housing efforts were often resisted especially by the Chinese as many were reluctant to move away from their jobs and communities which they have already established relationships with. 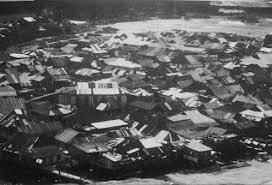 On 25 May 1961, the largest fire incident in Singapore broke out in Bukit Ho Swee, destroying 2200 wooden houses and displacing 16000 people. Inhabitants of Bukit Ho Swee were evacuated and housed quickly in temporary apartments just off the borders of Bukit Ho Swee. It was recorded that the fire caused one death and 67 injured. The cause of the fire has not been established since. The media then portrayed kampong Bukit Ho Swee to be a fire prone area which unfortunate incidents were waiting to happen. It also portrayed the fire to be a 'blessing in disguise' as the fire could clear the area for housing development to take place. However, many inhibitants of the Bukit Ho Swee area beg to differ in opinion. Rumours have it that the government gave incentive to people to start the fire. 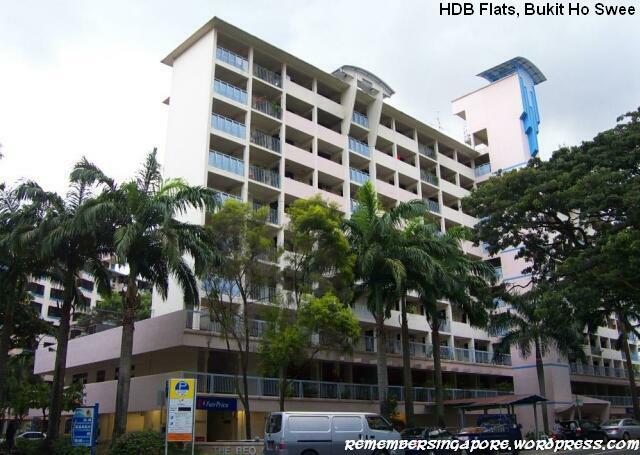 One inhibitant of Bukit Ho Swee claimed to have seen a man throwing a stick of fire to spark the tragedy. Loh, Kah Seng. 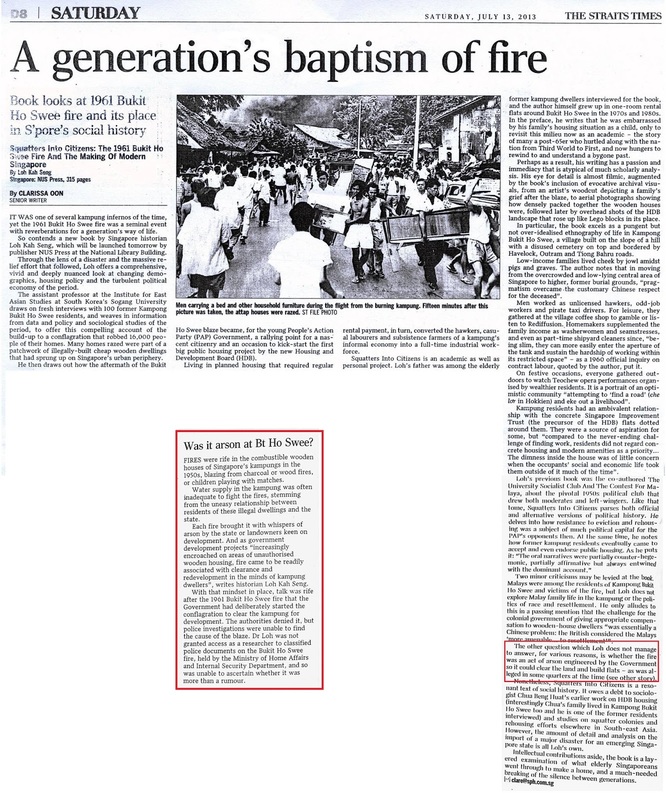 “The 1961 Kampong Bukit Ho Swee fire and the Making of Modern Singapore”. Murdoch University, 2008. Retrieved 30 July 2013. Chew, Melanie. “Leaders of Singapore”. Singapore:Resource Press. 1996. http://singaporegovt.blogspot.sg/2006/01/part-1-history-and-founding-of-pap-no.html Retrieved 30 July 2013. Chew, Valerie. “Public Housing in Singapore”. Singapore Infopedia. 2009. http://infopedia.nl.sg/articles/SIP_1585_2009-10-26.html, retrieved 30 July 2013. Singapore Broadcasting Corporation. Episode 12: “Bukit Ho Swee Fire”. 1988. https://www.youtube.com/watch?v=smMggwFO2KU, retrieved 30 July 1988. 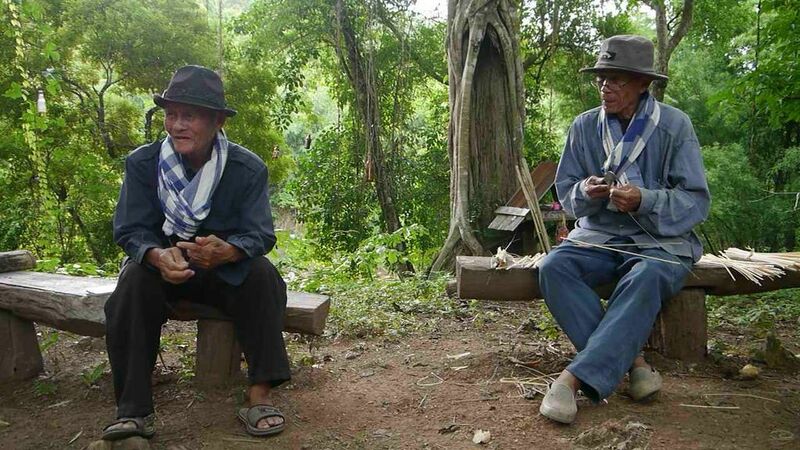 The Kaeng Sua Ten Dam project, a 3.5 billion Baht project1, has been proposed for over 23 years and has faced fierce opposition among the local communities, specifically the Sa-iab village. The project aims to build a large dam on the Yom River, along a geological fault line that transcends three major fault lines in society, politics and economy. The project was first cited as a hydroelectricity project, promising to generate 49 MW of electricity a year, during a time where Thailand has already domestically produced 140% it’s usage of electricity. Subsequently, the dam was promoted as an irrigation project, promising to allow farmers to be able to grow 2 or more cycle of crops each year. More recently, as a part of the political response to the flooding situation in Bangkok, the government has sold the dam project off as a necessity to prevent future floods in Bangkok. 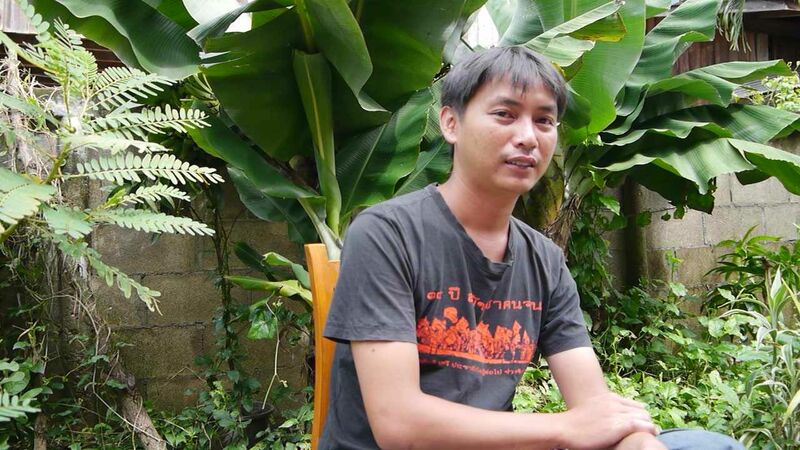 This recent development has pitted the villagers not only against the government, but also against the wider Thai society where they villagers are brandished as being backward and selfish. Besides the common accusation that the motivation behind the dam construction is that the government sees large dams as a sign of progress, there have also been accusation that potential kickbacks that officials and contracting companies stand to gain. It has been said that the 20% of the 3.5 billion Baht allocated for the project will never serve its intended purpose. With the viability of the dam being highly in doubt, the World Bank has since pulled out from the project but the Thai government is still adamant on going with the project and disregards the multiple studies published. Many studies have already been conducted; however the important way forward now is to ensure effective communication and participation of the villagers in the decision making process. The villagers have been strongly against the development of the dam since their knowledge of the project back in 1991. In order to reach an acceptable compromise, in recent years, the villagers have thus proposed by the construction of multiple small water retention reservoirs instead. In what appears to be a sign of advancement over this 23 years long issue, the Water and Flood Management Commission (WFMC), led by Deputy Prime Minister Plodprasop Suraswadi, has resolved to build two dams on the upper and lower Yom river along with 17 smaller water retention reservoirs. This move is in-line with the Yingluck administration which has promised to find a viable alternative to the dam project that ensures the livelihood of the villagers will be preserved. 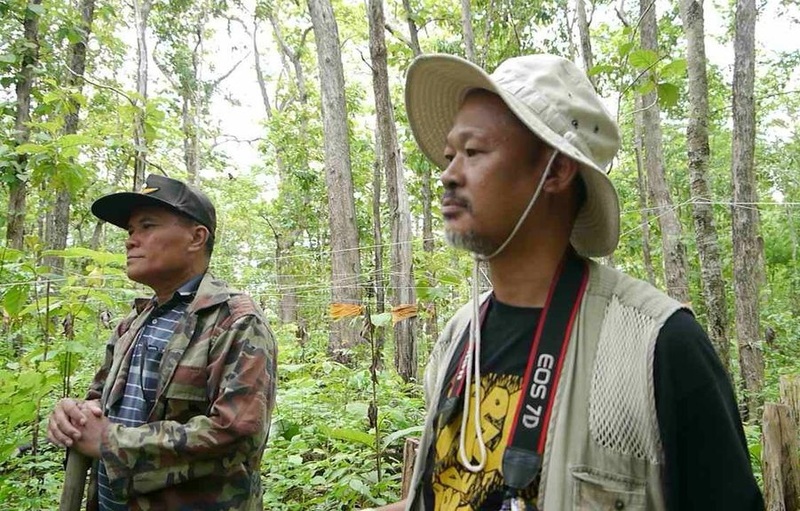 Mr Plodprasop said that the new project will not be in conflict with the villagers main concerns – the teak forest will be preserved and the village need not relocate. The new project also has a decreased budget, at 1.3 million Baht, down from the original figure of 3.5 billion Baht for the large dam project. The deputy premier is also optimistic that the new project would face no opposition from the villagers. However, upon visiting the villages in the Phrae province, strong protests against the alternative project were still received. Pi Bird, A member of the Forest Conservation Group and the Youth Group Coordinator at Donn Chai-Saktong, strongly opposed the alternative project, saying that the claimed smaller dams were actually not much smaller than the proposed Kaeng Sua Ten dam thus based on their research, the building of the 2 smaller dams would still call for deforestation and relocation of the villagers. Lebel, Louis, Bach T. Sinh, Po Garden, Suong Seng, Le A. Tuan, and Duong V. Truc. "The Promise of Flood Protection: Dikes and Dams, Drains and Diversions." Institution, Knowledge and Power. Vietnam: Tho University, 283-305. Science Magazine Newsletter Tho University. Web. 6 July 2013. <http://sj.ctu.edu.vn/index.php/qt2011/doc_view/2125-the-promise-of-flood-protection-dikes-and-dams-drains-and-diversions>. "Kaeng Sua Ten Dam: 12 Reasons for Not Constructing the Dam." Thai Publica. Thai Publica, 3 Jan. 2013. Web. 7 July 2013. <http://thaipublica.org/2013/01/kaeng-sue-ten-dam-1/>. "Govt Proposes Kaeng Sua Ten Alternative." Bangkok Post. Bangkok Post, 20 Feb. 2013. Web. 6 July 2013. <http://www.bangkokpost.com/news/local/336740/govt-proposes-kaeng-sua-ten-alternative>.